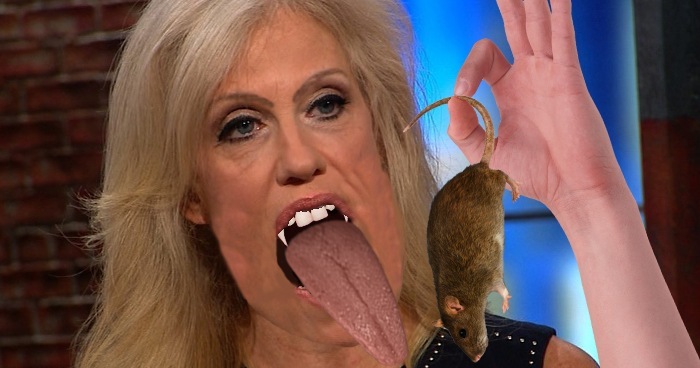 White House advisor Kellyanne Conway shocked reporters yesterday when she unhinged her jaw and swallowed a live rat in front of them. The incident took place at a press conference where she was defending President Trump’s latest 3 AM Twitter tantrum. Ignoring the flurry of questions that followed, she resumed talking about Trump’s newest allegation that Obama was selling aborted fetuses to witch doctors in Kenya without missing a beat. She went on to blast the mainstream media for what she claimed were personal attacks against her, citing the recent Oval Office photo controversy as an example. “I can’t even kneel on a couch without getting criticized for it, even though that’s the only way my kind can get comfortable when we’re carrying a clutch of eggs.” Conway refused to clarify her last remark, claiming the press would simply twist her words as usual. Public opinion was divided. Polls showed that 24% believe Conway is the manifestation of some sort of biblical horror, 21% believe she is a true American hero, and 55% wondered when NASA was going to colonize Mars, because they don’t want to live on this planet anymore.